If you want to become proficient in yoga in the Iyengar tradition, you must become absolutely neurotic about how your blankets are folded. There is simply no other way. 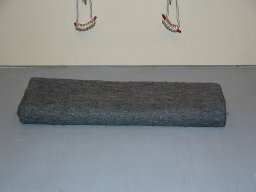 There are two main types of blankets in use in most Western yoga schools today -- the brown wool, "army-type" blankets that shed like English sheep dogs, and the Mexican blankets, also called "the cotton blankets" despite the fact they consist of 50% acrylic, 40% polyester, and 10% cotton. 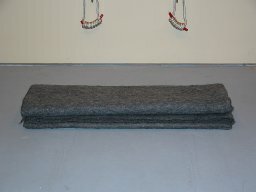 Let's look at the folding of each type of blanket starting with the wool blankets. 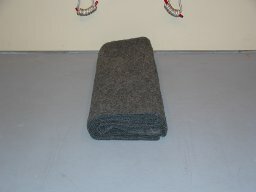 Each type of blanket has its own storage fold and it's important to learn how to fold the blanket into the storage fold. The storage fold gets its name from the fact that we store the blankets after we use them folded in this way (as in the photograph at the top of this page). 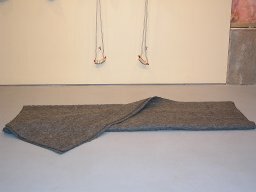 The storage fold is the "Tadasana of the blanket." 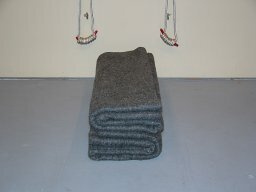 When you take a blanket out of the storage pile, if it has been put away properly, it will be in the storage fold. 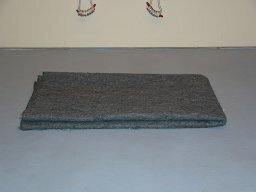 Unfortunately, with each type of blanket, there are several ways to mimic the storage fold that aren't quite correct. 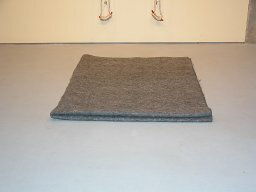 Note than the storage fold has a long dimension and a short dimension and, most importantly, a "neat" side (where the blanket fold is rounded) and a "loose" side (where the edges of the blanket are joined). 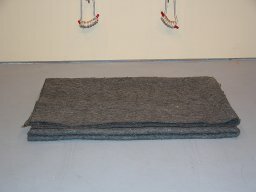 In the photos below, the neat side is in the front on the left and, turning the blanket around 180 degrees, the loose side is in the front on the right. 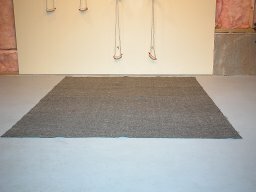 Distinguishing between the neat and loose sides of your blankets is crucial, as will become clear when we talk about how we use the blankets for support in asanas later on. The first fold had been made correctly, but then the subsequent two folds had been made length-wise rather than width-wise. 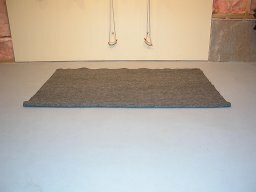 This may seem trivial, but if it is not clear already, the pseudo-storage-folded blanket above would have been far more unstable to use for support in, for instance, Sarvangasana, than a blanket in the correct storage fold. 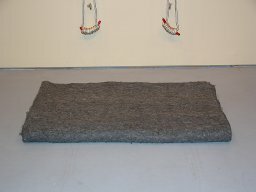 This will become more clear when we talk about how we use the blankets for support in asanas later on. 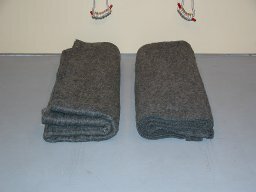 So go back and be clear about how to fold the wool blankets into their storage fold. 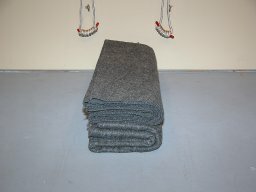 It's simple -- three folds made width-wise -- but easy to mistake; and if you attend classes at a yoga school, you will certainly find many blankets that are folded improperly lying in the storage pile. 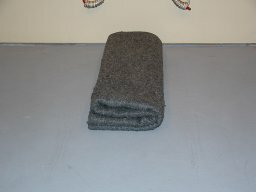 In the photo below, there are two blankets in this bolster-type of fold. In the blanket on the left, the neat, short side is in front and the neat, long side faces toward the middle. 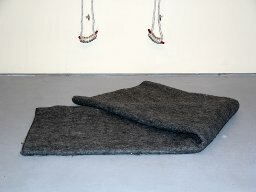 In the blanket on the right, the neat, short side is in the back toward the wall, and the neat, long side is again facing toward the middle. Observing these differences is important because, if you will fold a blanket this way, you will see that the neat long edge is a bit taller than the loose long edge and the neat edge provides much firmer, more stable support, if you sit on that edge for instance. The same is true of the short edges regarding height, firmness, and stability. None of these permutations of stacking are "correct" or "incorrect." They are all useful for different purposes. 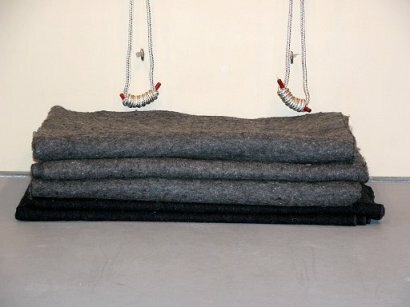 The best way to illustrate why knowledge of the ways of folding the blankets is useful is to show how the blankets are used to support different asanas.